Shio-koji 塩麹 got me going again. Given the previous success with chicken thighs and pork tenderloin skewers, the natural next choice was, of course, pork chops. In the U.S., pork chops are a very popular cut of pork but it is very difficult to cook them correctly especially on a barbecue grill—they often come out overcooked, tough, and dry. 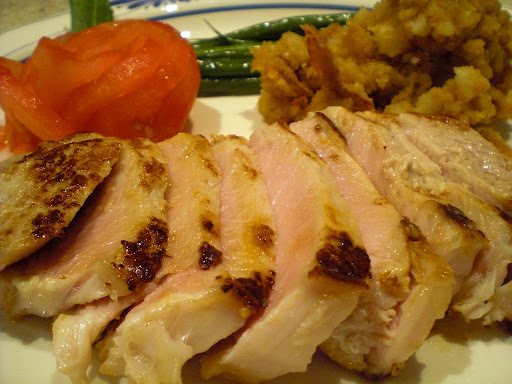 In Japan, SPF (Specific Pathogen-free) pork is popular and many restaurants may serve undercooked pork (center is still pink). But even SPF pork is not safe to eat raw or under cooked. Especially since some SPF pork was imported from other countries (especially South Asian countries). Even domestic (Japanese) SPF pork, requires a high level of faith in the level of inspection it has undergone. I personally have some doubt about how much regulation would be enforced. Although the risk of contracting something from eating undercooked pork in Japan maybe low, I just cannot trust blindly that pork labeled as “SPF pork” is safe undercooked. For that reason it probably a good thing that eating raw (sashimi) pork and beef liver was banned in Japan recently. Here is an interesting article about teneasis and cysticercosis in Japan. I have seen too many cases of cerebral cysticercosis in my line of work. I like my pork just perfectly cooked. I marinated two pork chops in shio-koji (again 10% weight or just thinly coat the surface of the chops) and marinated it in the refrigerator overnight. As a control, I also cooked one chop seasoned with just salt and pepper. In the image below, two chops in the back, which were just turned over, are the shio-koji marinated, one in front which has not been turned over is the control chop. I browned both sides of the chops (#2). As before, the shio-koji marinated one browned more because of the sugar and starch in shio-koji. I then placed the frying pan into the pre-heated 350F oven for 10-15 minutes until a instant-read digital thermometer registered 145F inserted in the thickest portion of the chops. I covered the pan loosely with aluminum foil and let the chops rest for 10 minutes (#3 is shio-koji marinated and #4 is the salt and peppered one). As far as pork chops go, this was not bad.I served this with a tomato rose, my wife’s smashed potato, haricoverts (first steamed and sautéed in olive oil with garlic and seasoned with salt and pepper). I sliced the chops so that we could eat them with chopsticks. 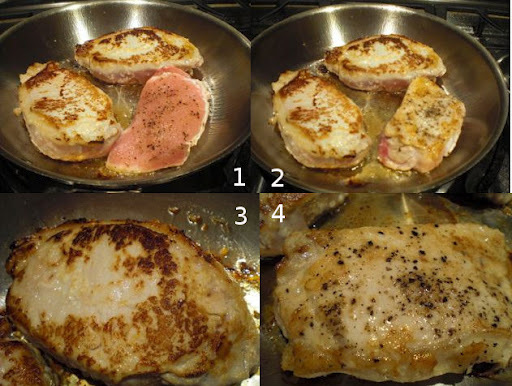 As you can see in the first picture, it is perfectly cooked with the cut surface ever so faintly pink but uniformly so because of the resting process ensuring no undercooked center. It was tender and juicy (as pork chops go). We compared this with the salt and pepper seasoned control chop (#4 above) and there was a discernable difference but it was not great. Interestingly though, it was a different story with the leftovers. When I sliced into the shio-koji chop for sandwiches the next day, it was much more tender and juicier than the salt and pepper seasoned chop which was dryer and tougher. So this was a qualified success.